Welcome to Foothills Farm & Kennel! Home of Goldreams AKC/UKC Ch Golden Retrievers and Samsong’s AKC/UKC Ch Samoyeds. Foothills Farm & Kennel offers both daycare and overnight boarding as well as simple grooming options. Foothills Farm has also gotten into the barkery business. 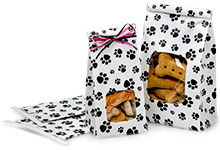 We now offer Snick Snacks, homemade doggie biscuits. Click on the link below to view our options. My passion for Golden Retrievers started in 1996 with a little puppy we named Goldreams Heaven Sent aka Buster. Buster was the perfect example of temperament in a golden. Buster excelled in obedience and at the age of seven we decided to put him through the trials to become a therapy dog and share our love of him with others. We thank God for the wonderful blessing he gave us of sharing our lives with such a beautiful boy. My passion for the breed has only grown. I have since gotten into the conformation ring where I have put several championship titles on my dogs. I pour my heart and soul into my dogs and their success will speak for itself. I would have never gotten this far without the support of my family who all share the same passion for the breed and the friends I have met on this wonderful journey. Golden Dreams Kennel is small kennel located in Jay, Maine. All my dogs have their eye, heart, hip & elbow clearance from a board certified vet in their respective field and all clearances are registered with OFA. We are not affiliated with any other kennel. I am a member in good standing with the Golden Retriever Club of America, Maine Golden Retriever Club, Samoyed Club of America and Minuteman Samoyed Club.